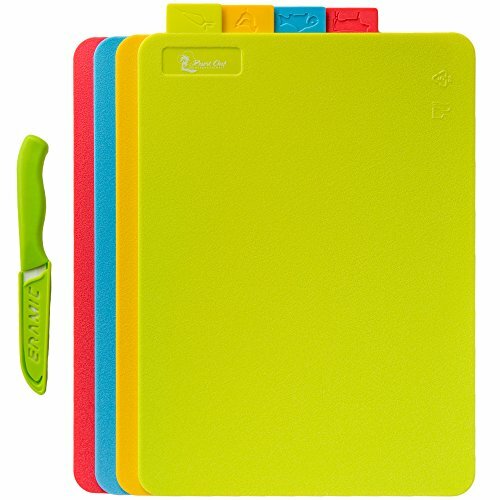 Resort Chef Cutting Boards for Kitchen - Set of 4 w/Food Icons - BPA Free FDA Approved Materials Reversible & Eco Friendly. Best for Food Safety Has Microban Protection. Includes FREE Ceramic Knife! ✂ The Best Kitchen Cutting Board made from recyclable Plastic lasts much longer than bamboo or wood boards and is easier to maintain. ✂ These chopping boards are used by professional chefs in kitchens across the country. Fantastic for meat and veggie prep! ✂ DISHWASHER SAFE for super easy cleaning! No warping or bending, these durable plastic cutting boards allow you to spend more time enjoying your wonderful meal and less time in the kitchen cleaning up.  FOOD SAFETY IS OUR TOP PRIORITY! Built-in Microban Antimicrobial protection inhibits the growth of stain and odor-causing bacteria, mold and mildew. Each Resort Chef International cutting board is color coded in bright, pleasing colors with food icons for meats, poultry, fish and vegetables to help prevent cross-contamination and food poisoning. 數 EASY TO STORE! Each medium-sized cutting board measures 11.7 x 8.5 x 0.1 inches. They stack together neatly and don't take up much space, so are convenient to store in drawers or cabinets. This makes the set of 4 the best choice for college dorm rooms, apartments, and camping! A perfect gift set addition.  BPA FREE and FDA APPROVED materials professional cutting boards! These Eco Friendly boards are certified tested to provide you and your family with the safest surface for food preparation in the industry today. They can withstand temperatures up to 230F or 110C and are loved by restaurant chefs, senior living communities and families across the country. The boards meet or exceed the most stringent California state regulations for food safety.  WON'T DULL KNIVES & EASY TO MAINTAIN. Best for all food prep, including slicing meat and chopping veggies. Kitchen, dining room or even barbecue. DOUBLE YOUR INVESTMENT! No board will last you forever, but these high quality kitchen utility cutting boards are reversible and can be used on both sides, effectively lasting you twice as long.  FREE CERAMIC KNIFE INCLUDED! Every purchase comes with a 3" ceramic paring knife. Have you ever had the pleasure of working with a ceramic knife? If not, then you are in for a real treat! This knife remains sharper and lasts longer than traditional steel knives. Also has a knife cover for safety and easy storage! If you have any questions about this product by Resort Chef International, contact us by completing and submitting the form below. If you are looking for a specif part number, please include it with your message.